Chuck Norris Bio, Net Worth, Wife, Age, Height, Where Is He Now, Is He Dead? Chuck Norris is an actor, a movie producer, screenwriter, and martial artist. Though he is popularly known as a “tough as a nail” actor mainly displaying his martial arts skills on screen, most people do not know that this skill was acquired while serving in the U.S military. Today, Chuck is one of the most accomplished actors and coach who built his career on this highly sought after skill especially in the 80s and later as a result of the high demand for karate-themed action movies. Today, he spends more time with his family as well as pursuing life-changing causes for others. Carlos Ray Norris was born in Ryan, Oklahoma on the 10th of March 1940. He was born to mother, Wilma Scarberry, born May 4, 1921, and father, Ray Norris (1918–1971) who was a bus driver, a truck driver, a mechanic, and a World War II soldier in the US Army. He has two younger siblings, Aaron who happens to be a Hollywood producer and Wieland (1943–1970) who died in Vietnam. His parent got a divorce when he was 16 and thus, he moved with his mother and two brothers to Prairie Village, Kansas, and later to Torrance, California. Norris didn’t have such a pleasant childhood as he was a very shy kid and has described himself as “a nonathletic and mediocre” as a kid. He revealed that much of his self-withdrawal came from the fact that his father who worked intermittently as a mechanic was an ardent drunk, one who would usually go on a binge drinking spree everytime he had the chance. To make matters worse, his family’s finances was very deplorable. At the age of 18, Chuck Norris joined the United States Air Force to serve as an Air Policeman (AP). He was posted to Osan Air Base, in South Korea. It was during his service there that he acquired the nickname Chuck and also began developing his skills in Tang Soo Do (tangsudo). For training in Tang Soo Do, he developed much interest in Black Belt. Upon his return to the United States, he continued serving as an Air Policeman at the March Air Force Base. In August 1962, Norris was relieved of his duties from the U.S. Air Force having served diligently. He made his acting debut in 1969 when he starred in the movie titled, The Wrecking Crew. 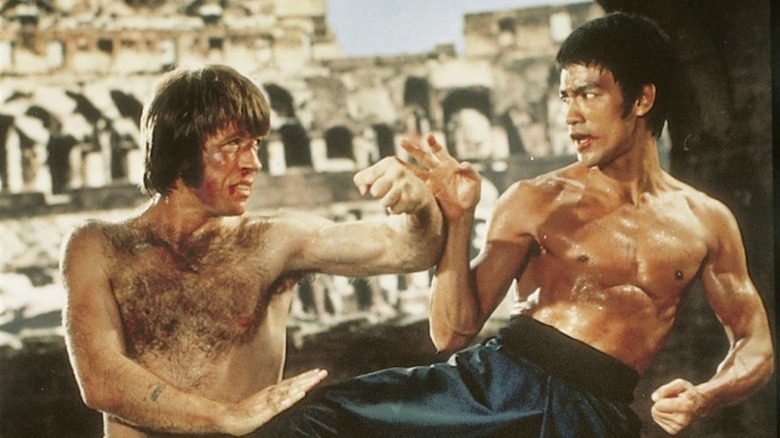 Following the success of the movie, he was billed to act alongside Bruce Lee in the highly successful movie Way of the Dragon. Its title was changed to Return of the Dragon for its U.S release. Other critically acclaimed movies he has starred in include; the Missing in Action trilogy, The Delta Force, Good Guys Wear Black, Lone Wolf McQuade, Code of Silence, The Octagon, among many other minor roles. Between 1993- 2001, Chuck Norris worked extensively on television when he was cast as Cordell Walker in the television series Walker, Texas Ranger. He also penned down a good number of books which cut across a good range of topics including; martial arts, exercise, philosophy, Christian religion, politics, western novels, to biography. His very first book was published in 1975. It was titled Winning Tournament Karate, a book based on the practical study of competition training for any rank including all segments of conditioning, fighting form drills, one-step sparring techniques and executing speedy attacks. In 2005, in a new age of technological advancement and the World Wide Web, Chuck Norrick somehow became an internet sensation, though it wasn’t planned it happened anyways. He caused quite a buzz with the comical Chuck Norris facts, a document which reveals what is fiction and non-fiction when it comes to the tales told about him and his career. Two video games and six books emanated as a result of this in the moment sensation of which two of the book are New York Times Best Sellers. After bursting into the entertainment scene in the late 50s, Chuck Norris featured in a lot of blockbuster movies to his credit as well as best selling books. He also is a martial arts instructor who owns his own studio where he teaches the arts. He also has endorsements such as the “Total Gym” infomercials that have added significantly to his revenue over the years. As with current celebrity financial data, Chuck Norris is worth well over $70 million. Norris became good friends with Dianne Kay Holechek who was just a year younger than him. They both met in 1956 while they were still in high school in Torrance, California. Marriage came just two years later as they both tied the knot to a small gathering of friends and family in 1958. Their first son, Mike came along in 1962. The following year, he had a daughter out of an extra-marital affair. A second son named Eric was welcomed with his wife in 1964. Unfortunately, the pair divorced in 1988, after 30 whole years together. Chuck Norris poured himself into his work after the divorce but in 1998, he met a new woman, a former model, Gena O’Kelly Gena was 23 years younger than him, however, Norris and Gena wedded that same year on the 28th of October 1998. Though she had two children from her previous marriage, she gave birth to twins children for Chuck Norris on the 30th of August 2001. As movie star or at least one intending to get into showbiz, one might be at an advantage to have some inches in terms of height. Not saying that this is a criterion but it sure helps to get most of the juicy roles because not many roles are written for people with a smaller than average height. Having said that, Chuck Norris would have to count himself lucky as he stands tall at 5 feet 10 inches (178 cm). When merged with his fighting skills and on-screen charm, he sure gives the audience an all-around treat. In 2012, there was a rumor circulating that the martial arts fighter and movie star had passed on to the great beyond at his home in Northwood Hills, TX at the age of 77. However, this news was quickly discovered to be false as the star cleared the air on his social media accounts. The star is very much alive and even celebrated his birthday 78th birthday on the 10th of March 2018. See Also: Jackie Chan Son, Daughter, Wife, Family, Height, Net Worth, Is he Dead? Though his career has slowed down as a result of the age factor, he has turned his focus to other meaningful causes which include; assisting the “Make-A-Wish Foundation” as well as providing help for wounded veterans and service members. In 1990, Norris alongside the former U.S president, George W. Bush spearheaded a not-for-profit program named “Kickstart Kids: Character through Karate.” The program aimed to teach school student karate so as to build their self-esteem. The program is highly successful as it has been incorporated in 56 schools with as much as over 8,000 participants.